Hace dos días estuve con mi hija Ana curioseando en tiendas de manualidades. Para ella todo lo que veía servía para crear algo. Cogía una cosa y casi sin pensar ya se le había ocurrido qué hacer con ella. Los niños tienen una gran ventaja: no tienen límites, su imaginación es desbordante. De las cosas que compramos finalmente, Ana cogió unos espejitos, un cascabel y un corazón e hizo con cuerda e hilo un móvil para su habitación. A mi no se me hubiera ocurrido mezclar esas cosas. Obviamente, poner en práctica sus ideas no siempre es fácil o posible. Muchas veces chocan con la Física, pero vamos solucionándolo. Two days ago I was with my daughter Ana browsing in craft shops. For her, everything she saw was useful to create something. She took one thing and almost inmediately she had already thought what to do with it. Children have a great advantage: they have no limits, their imagination is unlimited. Among the things we finally bought, Ana took some little mirrors, a bell and a heart and she made a mobile for her bedroom with a string and thread. I would never have thought to mix those things. Obviously, to put her ideas into practise is not always easy or possible. Many times they clash with Physics, but we find a way to resolve it. Diseño de Bird from a Wire. Design by Bird from a Wire. Yo soy muy cuadriculada, por eso me cuesta diseñar. Hay personas que tienen verdadero talento, han conseguido evitar las barreras en su imaginación. Los demás tenemos la alternativa de ser curiosos, observar, aprender y disfrutar de lo que nos rodea. Y así las cosas van saliendo. Por ejemplo, yo sé cocinar y eso me permite no hacer caso de las recetas, casi siempre cambio ingredientes y hasta la forma de cocinarlas. Bueno, pues lo mismo pasa con todo. Si dominas una técnica y abres tu mente a las influencias que vas recibiendo al final sale algo propio. I am very rigid, that is why it is difficult for me to design. There are people who have true talent and have managed to avoid the barriers of their imagination. The other we choice of being curious, observe, learn and enjoy what surrounds us. And so, things emerge. For example, I can cook and that allows me to follow the recipes and I almost always change ingredients and even the way of cooking them. Well, the same thing happens with everything. If you konw very well a technique and open your mind to influences you receive, finally something personal appears. Hay una artista, Jennifer Swift o Bird from a Wire, que me parece muy especial e imaginativa. Para su trabajo emplea tela, alambre y pintura fundamentalmente, pero también otros muchos materiales. 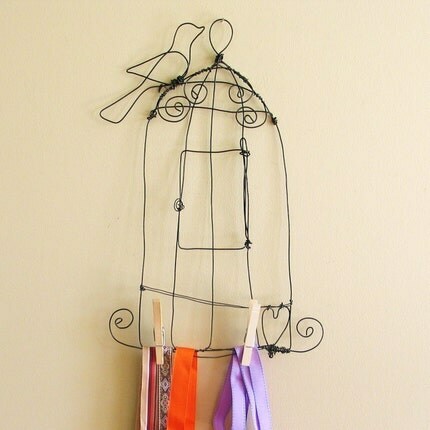 There is an artist, Jen or Bird from a Wire, which seems to me very special and imaginative. She basically works with clothes, wire and paint, but also many other materials. Diseños de Bird from a Wire. Designs by Bird from a Wire. Por eso sus creaciones me transmiten libertad, además de parecerme muy bonitas. Y como suele ocurrir, su blog es igual, muy personal, os lo aconsejo. Además tiene un apartado de tutoriales en el que explica como realizar algunos de sus proyectos. Por cierto, en noviembre va a publicar un libro: Creative Bloom: Projects and Inspiration with Fabric and Wire. That is why her creations transmit me freedom, in addition to being very pretty. And as usual, her blog is also very personal, I advise it to you. It has a section with tutorials where she explains how to make some of its projects. 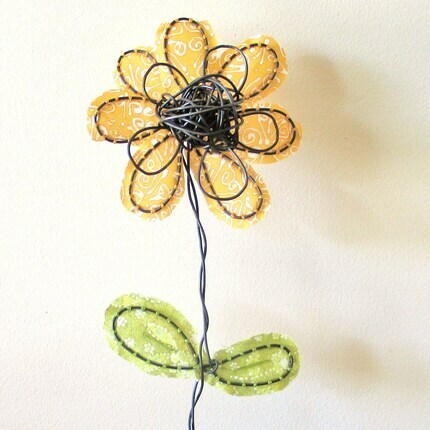 By the way, in November she will publish a book: “Creative Bloom: Projects and Inspiration with Fabric and Wire”. Otra artista muy muy original es Magda Sagyeg, miembro de Knitta Please. No sabría bien como explicar su trabajo. Titula su blog como "We knit graffiti" y eso es lo que hace en realidad. Lleva el ganchillo a la calle como forma de expresión artística. Es lo que se llama Street Art, que engloba formas de arte callejero que van más allá del spray. 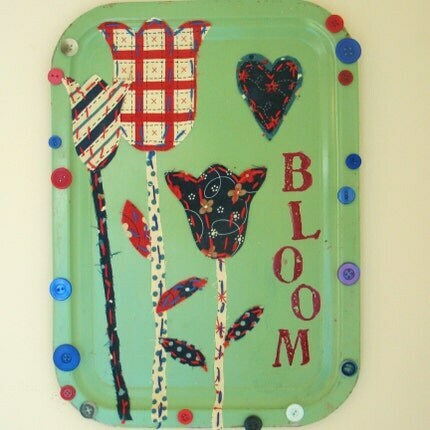 Another artist very very curious is Magda Sagyeg or Knitta Please. I would not know how to explain her work. 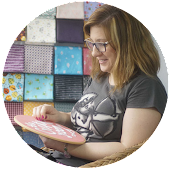 She calles her blog "We knit graffiti" and that is what she does in fact. She takes crochet to the streets as a form of artistic expression. That it's called Street Art and includes different forms of this art apart from the spray. En YouTube podéis ver los vídeos en los que muestra como prepara sus obras. Además de los miembros de Knitta Please hay otros artistas que han llevando el ganchillo a la calle, como Knit the City, Maskerade y los componentes de Guerrilla Knitting. You can watch the videos where she shows how she prepares her works on Youtube. Besides the members of Knitta Please other artists have also taken the crochet out to the street, like Knit in the City, Maskerade and Guerrilla Knitting. En definitiva, unos utilizan la imaginación y otros optamos por la inspiración. In resume, some people use imagination and other choose the inspiration. Fabuloso, me encantaría encontrarme algo así por la calle! Thank you, thank you, thank you! Everything you said was so sweet- I really appreciate it. 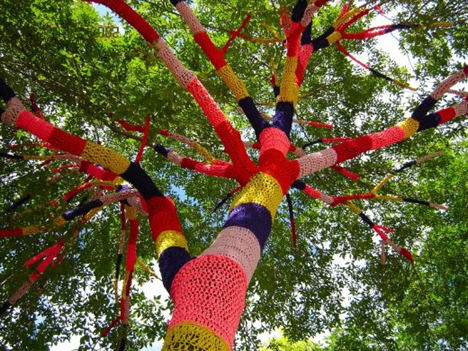 :) Have to say I love the knitted tree too. Something I would never have thought of but would love to come upon when walking around a park. Fun! Me ha encantado. Estás consiguiendo que cada semana espere impaciente la llegada del aviso de que has publicado un nuevo artículo... Mil gracias por los buenos momentos que me haces pasar al leerlos.